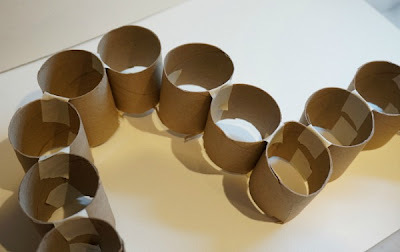 It’s amazing to me how many ways you can reuse a toilet paper roll. Once the roll is emptied of tissue it can take on a life of it’s own. 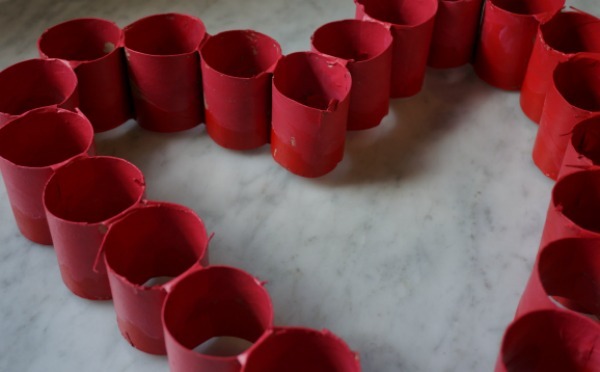 We transformed a pile of old rolls into this beautiful Valentine’s Day Heart. 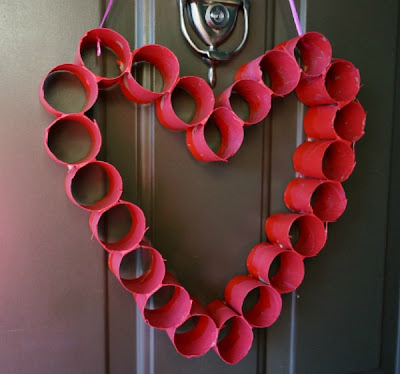 Last year we used toilet paper rolls to stamp valentine’s cards for friends and family. We also turned toilet paper rolls into necklaces for Valentine’s last year. So, it was no surprise when this year I had toilet paper rolls on my mind. We love making something new to hang on our front door and for Valentine’s day we love hearts. Logically, we landed on making a toilet paper Valentine heart for our front door. Cut all of the toilet paper rolls in half. You could use paper towel rolls, wrapping paper rolls or any other cardboard rolls you have laying around. 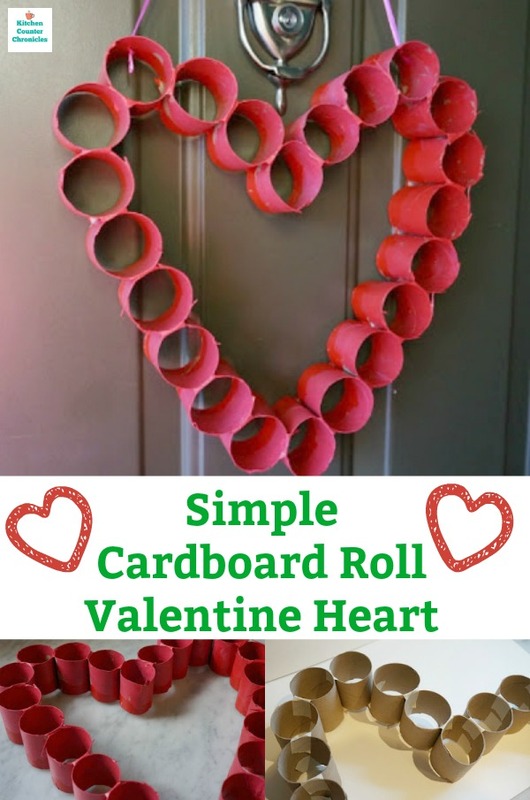 Layout a heart shape with the toilet paper rolls, crimp the rolls for the bottom point of the heart and the top indent of the heart. 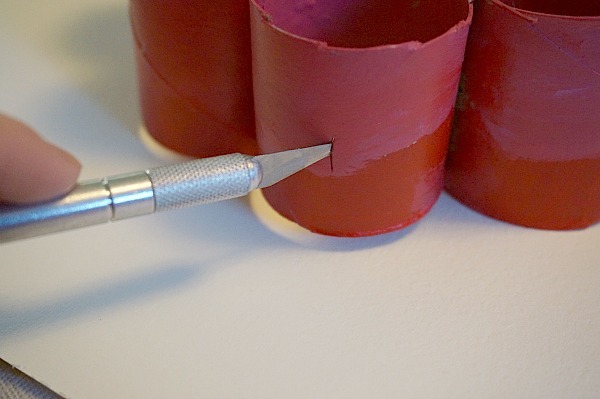 Use the masking tape to adhere each roll to the next. 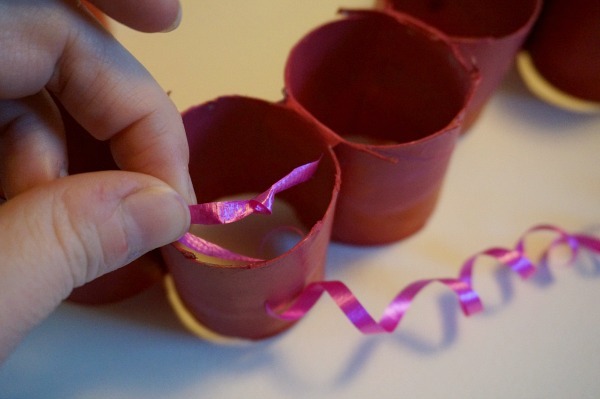 Alternately, you could use a hot glue gun…but I was trying to make this project as kid-friendly as possible. Once assembled, paint one half of the heart at a time…the half that is away from the table top…we decided to paint ours in two tones of red and pink…but you could use just red, just pink or whatever colour your child likes. Once the paint has dried, flip over the heart and paint the other side of the rolls. When the entire heart is dried, you may want to paint a second coat. Once the paint has dried, it’s time to make a hanger for the heart. Use a hole punch or a utility knife to create a small slit in the top of the heart…this is where you will hang the heart from. Now, feed the ribbon into the slits/holes and tie a knot. Hang the heart on your door and enjoy. 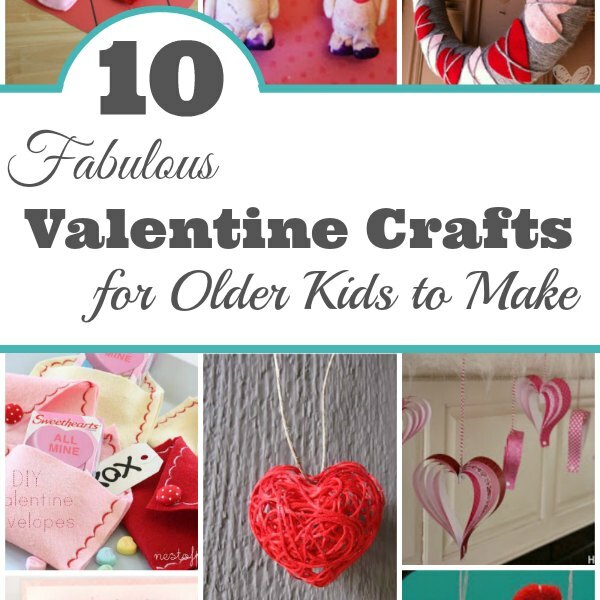 This craft is super kid-friendly. Waiting for the paint to dry requires kids to have patience, which is always a valuable lesson for kids. 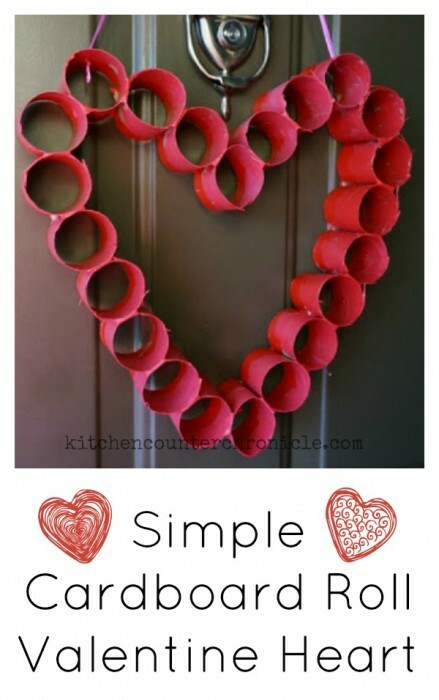 I am also going to surprise my girls and make a heart for their bedroom doors. I think I will make a smaller version for their doors. I may even fill some of the toilet paper rolls with chocolate kisses. Love these ideas – then read our 10 Fabulous Valentine Crafts for Older Kids to Make and 10 More Fabulous Valentine Crafts for Older Kids to Make. Follow Jen at KitchenCounterChronicle’s board Valentine Activities, Recipes and Crafts for Kids on Pinterest. Previous Post: « Quick DIY – Super Bowl Football Field Table Runner – Touchdown! This turned out really cute. It’s amazing what you can do with toilet paper rolls!